Hexagon Theatre Reading 1983 and Number One national tour. 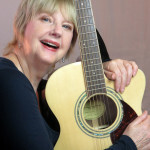 Script and demo cd available. 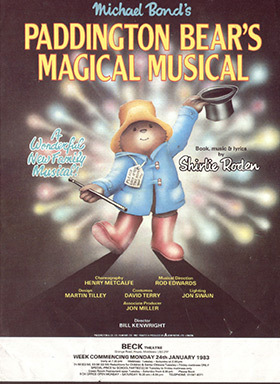 A through-composed children’s operetta, “Paddington Bear’s Magical Musical” was the first full-scale musical to be created for the well-known character, in celebration of Paddington’s twenty-fifth birthday. Charting the arrival of the little stowaway from Peru, it explores some of the bear’s adventures from Michael Bond’s best-selling books, together with the Brown family and friends Mr. Curry and Mr. Gruber and features songs such as “Please Look After This Bear”, “Marmalade’n’Me”, “Do the Duffle”, “Wellington Waltz”, and Paddington’s big ballad “Cross My Paws and Hope to Die” (later re-recorded by actor Martin Shaw as “Cross My Heart and Hope to Die”). Cast size:15 plus two children’s choirs on stage in the style of “Joseph”.